How Do I Know if I Have TMJ or TMD? I’m at a loss. I’ve been doing some research and have narrowed it down to two conditions, but I can’t tell the difference between them so don’t know who to see. Do I have TMJ or TMD? Who do I see for it? I understand why you’re confused. These two acronyms are used interchangeably. TMD stands for Temporomandibular Disorder. TMJ stands for Temporomandibular Joint. When the joint is out of alignment, which can happen for several reasons as seen in the chart above, it causes TMD. Your symptoms are pointing to this disorder, whether you call it TMJ or TMD. You’ll want to see a dentist, but not just any dentist. 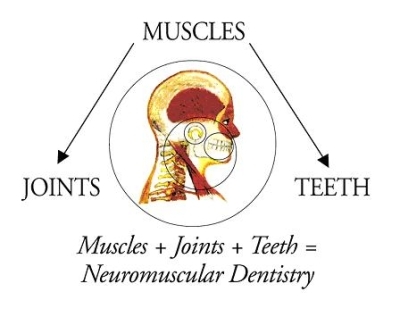 First, not all dentists treat it because it is so complex. Secondly, some do treat it who shouldn’t. You really want a dentist who’s invested significant training in diagnosing and treating this disorder. As an example, look at Dr. Burba’s TMJ Dentist credentials. This is the type of dentist you want to find in your area. Because TMJ is so complex, it is imperative your dentist finds the underlying cause of your TMJ in order to begin proper treatment. You also want to start with the least invasive treatment possible. For instance, if it turns out your problem has stemmed from nighttime grinding, the first thing to do is protect your teeth from any further damage. From there, you can take up repairing the damage. Maybe your teeth are ground down to nubs and you need dental crowns. Or possibly, your teeth have been pushed out of place and you need Invisalign to realign your bite. Maybe you need a combination. The key is a dentist who knows what to look for. Options to Dentures or Dental Implants? I’m having every tooth extracted. It’s a long story I won’t go into as to how this happened. I’m looking for options now. My dentist wants me to get a dental implant on every tooth. Even if I owned a house (which I don’t). I’d have to sell it to pay the cost of something like that. He said if I didn’t do that I’d have to get dentures. I don’t want that either. Isn’t there a middle ground? Absolutely there’s a middle ground. There’s also varying degrees of ground. I’m personally appalled that your dentist gave you only those two options. That’s like telling a potential homebuyer they either purchase the multi-million dollar mansion or they’ll have to like in a decrepit shack with no power. Ethically, he’s supposed to inform you of all your options. First of all, you can get dental implants without having an implant placed at every tooth. In fact, only the richest of clients could afford something like that. 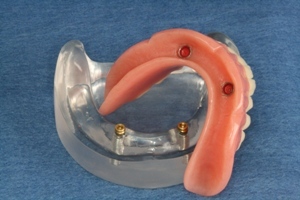 When all your teeth are missing, patients normally get implant supported dentures. 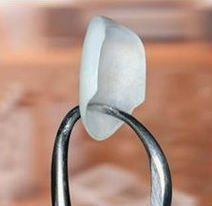 It utilizes a dental implant, but they’re anchored to your jaw with implants. Obviously, the more dental implants you have placed, the more secure they’ll be. However, you can get them with as few as two. These are generally called snap-on dentures. They help keep the denture from slipping out. It also preserves your bone where the two implants are placed. That’s very important. In fact, the more implants you have placed, the more you’ll prevent the facial collapse that comes with jawbone shrinkage, one of the biggest problems with dentures. When you remove your teeth, your body begins reabsorbing the minerals in your jawbone to use elsewhere throughout your body. It’s remarkably efficient, but devastating to the use of dentures. Eventually, your jawbone shrinks to the point where there’s no way to keep the dentures in. Every implant placed, including those from snap-on dentures, retain the minerals in each place there are implants. That’s because your body recognizes the implant as a tooth root and knows you need the jawbone intact in that area. This is one of the reasons I’m frustrated with your dentist. Just telling you about dentures without giving you the dangers and how to prevent them is irresponsible.